This canvas happened spontaneously. It was not planned by the artist. Just once he met this man and, having learned about his plight, invited him to pose for the canvas. And he did not refuse. I came to the appointed place and stood for hours in a given position, the money was still in my pocket. And Mane tried and believed that this particular painting would bring him success. Although, what could bring success? Yes, Manet departed from his previous historical works and returned to life, as it were, to reality. But what did he like in this man so much that he immediately decided to sketch it? Poverty, alcohol addiction or something else? Most likely, it is the latter. 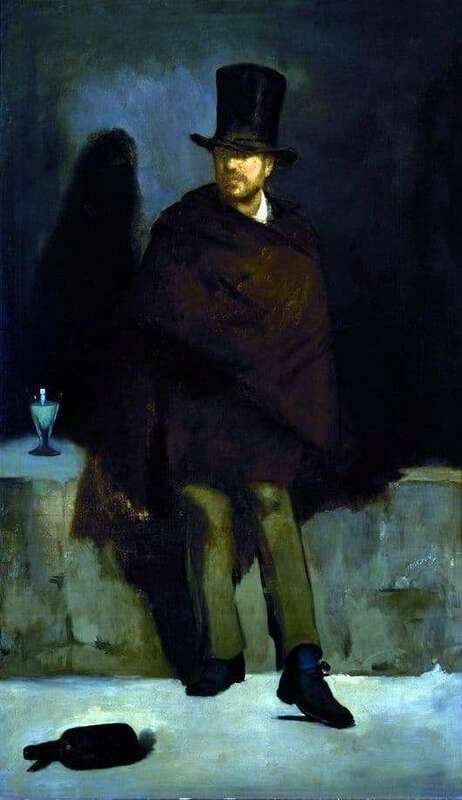 Mane portrayed this man drinking or already drunk, but not lost his human dignity. This is exactly what the artist wanted to show. And when the canvas was finished, Mane first of all decided to show the work to his teacher Couture, but he rather negatively spoke about the canvas and in general did not allow him to exhibit this canvas at the exhibition (his voice was decisive on the jury). But Manet did not give up, he stubbornly believed that this particular canvas should be the most powerful of all his works. Nobody really saw this picture then, but who saw it was surprised, insulted, or just silently passed by. But the quarrel Manet with his teacher did not pass without a trace. It so happens that two people who understood each other from the midtones, suddenly became enemies and, moreover, forever. Manet, after such cruel criticism, no longer communicated with his mentor. And what about the canvas? It did not disappear, did not die. It is currently quite expensive, but then it was this work that greatly changed the creative path of Edward Mane. In any case, for a long time the artist was looking for his own way, a new way in the works.